If you are a Windows users you might seen applications crashing once in a while which is also one of the main reasons for Windows to freeze up.Some applications like Firefox lets you restore tabs incase it crashes similarly It would be handy if you automatically restart the application incase the programs were closed accidentally or closed on crashing .Incase a application like a firewall, antivirus which need to be running always in the background for your system security crashes or closed accidentally and if such a thing if left unnoticed can leave your system vulnerable to attacks.Monitoring if applications are running or not always is not always possible. 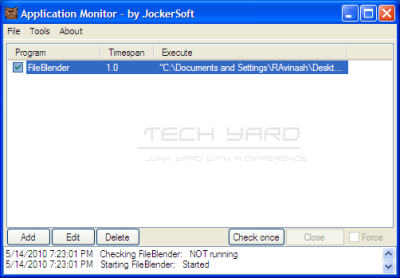 Application Monitor is a portable tool that can keep track if the applications are running or closed.In case if the application detects that one of those processes/program has stopped working it will start them back again automatically.Time interval for checking if the program is running or not can be set and Timespan between checks can be individually be set for each program. Enter Program Name, Browse and Select the Application .exe file and Set the Time Span between checks. The check the remaining for the next time check just mouse over the application name.The program can also be set to launch on Windows startup, so that the application can keep monitoring programs right from the beginning.Incase of errors the application can also send you an email alert aswell, the log file is also created to keep track of any errors. The tool requires to have .Net Framework installed and works is compatible with all Windows OS. Nice plugin which does the work in quick and easy way.